A page from the 1934 scrapbook of newspaper clippings from the Arkansas City (Kansas) Traveler, dated from December 14th, 1934 to December 31st, 1934 . The scrapbooks were created by local Red Cross volunteers. 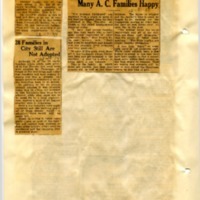 Articles during the Depression years covered food and other relief efforts, and documented unemployment issues. Arkansas City (Kansas) Traveler, “1934 Red Cross Scrapbook: December,” Digital Arkansas City, accessed April 24, 2019, https://arkcity.digitalsckls.info/item/121. Although 30 of the 58 needy families whose needs were printed in The Traveler last week have been adopted for Christmas, officials of the Red Cross said today that inquiries had been coming in slowly and that a greater response would be necessary if all of the deserving were to be helped. In addition to the 30 groups already adopted it was reported today that 11 others not included in The Traveler’s lists have been adopted while nine more are to be cared for by a local organization, making a total of 50 families adopted with 28 remaining. Only a few inquiries were made yesterday and this morning and if all of these should result in adoptions there would still be many left. Speed in calling is being especially urged as most of the families will require food, clothing or some other articles which must be purchased and the shopping time is growing short. “The happiest Christmas" was reported from a dozen or more of the families adopted from the lists published in The Traveler, officials at the relief headquarters reported today. In spite of this good work there are a few instances where Christmas help was not extended to the neediest. A plea for a stove is being made in one instance. children. The father is crippled and the mother’s time is taken up largely by her washing for the youngsters. Having no other way, she uses an iron kettle over an open fire in the yard. A four hole “Topsy” or wood cook stove is the preferred type. While relief officials have a few dollars to spend in this case they have been unable to find a second hand stove within their means, or one that would be donated. They are hoping that someone will be able to help extend the Christmas season by this kind of gift.